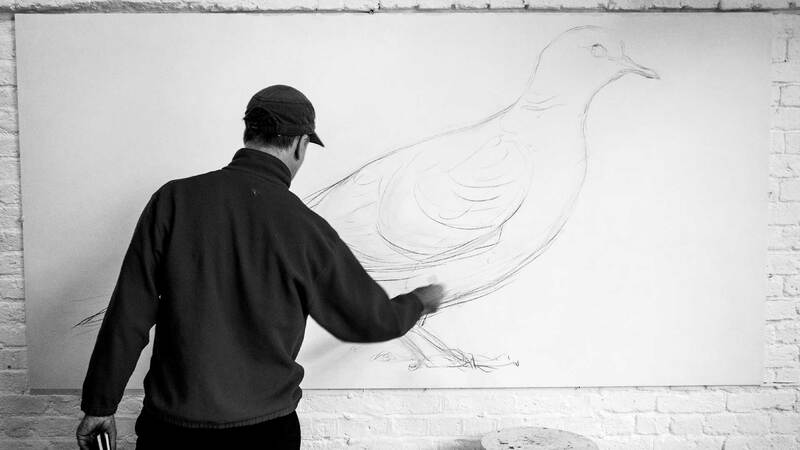 ATM is a street artist painting birds threatened with extinction. 1439 bird species are now in serious decline across the world, including 67 species in Britain. London based ATM has a lifelong love for nature. He has a particular connection to birds, their songs, calls and habitats. He uses his skills as an artist to celebrate the beauty of birds and communicate the extinction crisis. His giant wildlife murals fill walls across London to Bristol and on to Poland and Norway. ATM uses his art to inspire people to take part in local regeneration efforts and believes that small changes repeated on a large scale can have dramatic effects. Ultimately we can, and must, welcome birds and ecological abundance back to our country. Birds are often the most noticeable creatures to disappear, their loss the warning sign that something is fundamentally wrong in the way we treat our environment. They are the canary in the mine. We as human beings are very much a part of the whole web of nature, dependent on a healthy environment like every other living creature. It is so easy to forget this in our modern industrialised world where we are insulated by comfort and technology. We must learn a greater love and respect for other living things if we are to avert global disaster. My hope is that together we really can bring about fundamental change in modern farming practices, city planning and local Council approaches to public land. It’s a matter of culture. We need to see untidiness and unruliness as a virtue that makes life possible for myriad creatures, instead of something that must be curtailed. I want to see towns and cities rich in wildflowers, a countryside with dense hedges, ponds, vast reed beds, new forests, woodland and little copses.